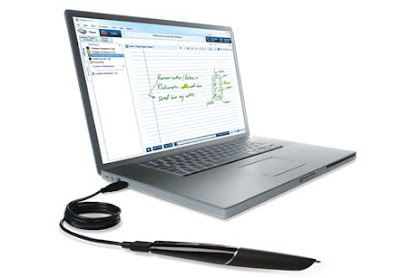 Echo Smartpen, as the writing gadget being called, is a pen with electronic capabilities to captures your handwriting and recording audio in a simultaneous manner, a neat companion for students, journalist, copy writer or even a writer. Not in an attractive shape, since Echo Smartpen comes in a large body design, however, the synchronization capability will surely amaze you. The Echo SmartPen could help you to retrieve what the speaker said once you touch down on the point of the note you have written on the Dot Paper Notebook. Echo Smartpen comes with a standard 3.5 mm audio jack, a micro-USB port to recharge and you could download audio files to the computer. There are two storage capacities being offered, the 4GB and 8GB models, with capability to record up to 400 and 800 hours respectively. And with the LiveScribe Application Store you could get more than 60 different applications, including a complete 120,000 word American Heritage Desk Dictionary. 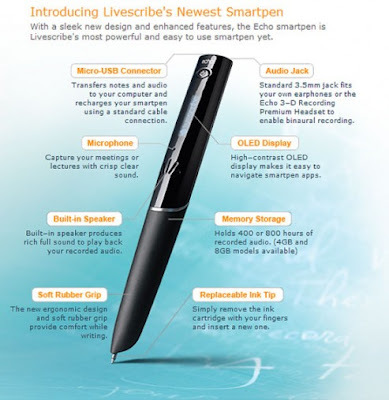 More info on the technical specifications from LiveScribe here.